Chatterbox paper is classified into coordinating room collections. This system takes the hard work out of choosing your patterned papers by making it easy to mix and match the papers to suit your page. It also gives you the opportunity to use colours you may not always consider by showing you how well they coordinate with more common colours. This layout shows how the combination of browns, oranges and greens can be used to draw together your photos of the great outdoors. This layout was created using papers from the Chatterbox Greenhouse Room collection (Greenhouse Marigold Paper, Greenhouse Stripes Paper and Greenhouse Paisley Cardstock), white cardstock and coordinating ribbon. Begin by cropping your photos. 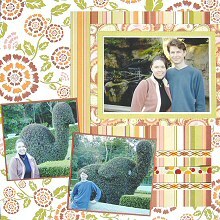 Mat your main photo on white cardstock and again with the underside of the Greenhouse Marigold Paper. The Greenhouse Marigold Paper is the paper you will be using for your background. You may want to cut your mat from the middle of your background, using a section that will later be covered up with other papers or you may prefer to use another sheet of the paper. The choice is yours. Mat again with Greenhouse Paisley Cardstock. Mat your other two photos with the underside of your Greenhouse Stripes Paper and set aside for later. Cut a piece of Greenhouse Stripes Paper measuring approximately 19cm by 26.5cm. Adhere three pieces of coordinating ribbon along the bottom, as shown in the layout above. Position on the right-hand side of your background page. It should be centred vertically and about 1.8cm from the right edge. Use the flowers to help guide your placement. Adhere into place. Position your main photo mat on top of the striped paper. Position it towards to the top of your page and on the right-hand edge. Adhere into place. Finally, adhere your two remaining photos in the bottom left-hand corner. They should be angled, with one overlapping the other.